For several years now, cooling solutions made by Austrian company Noctua have proven to be very silent, reliable and quite powerful at the same time. Considering Noctua fans on a large scale, they combine all the best and high-tech features, like specially shaped impeller blades or fan motor with high-quality bearings. Moreover, major part of construction elements implemented in Noctual products, and fans in particular, were designed and developed by Austrian Institute of Heat Transmission and Fan Technology. All those improvements are meant to increase overall product durability, efficiency and reduce noise level. 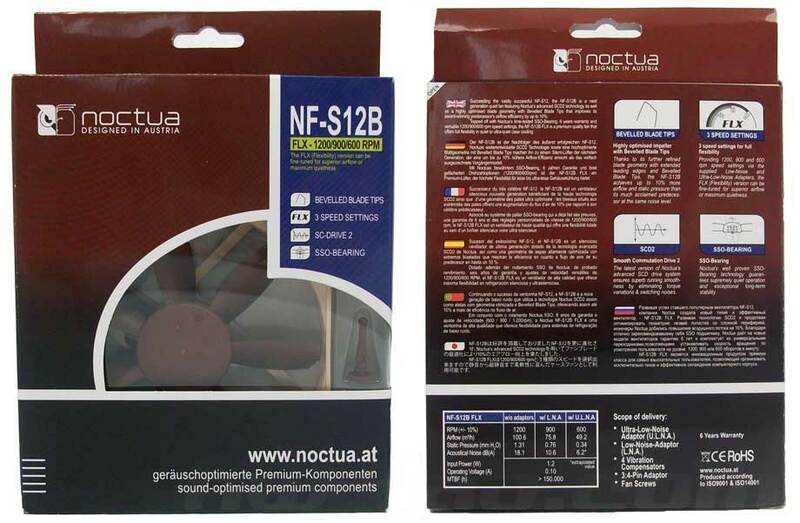 A series of Noctua NF-S12B fans, presented back in April 2009 includes two models: NF-S12B ULN and NF-S12B FLX. Today we will take a closer look at the second one, NF-S12B FLX, kindly provided by Noctua company. Noctua NF-S12B FLX comes in a original package with a small transparent window opening the view to the fan and its unique blades. We must say, the package is quite informative too: the back of the box includes a short product description in seven languages. Company also pays strong attention to design philosophy of the fan. 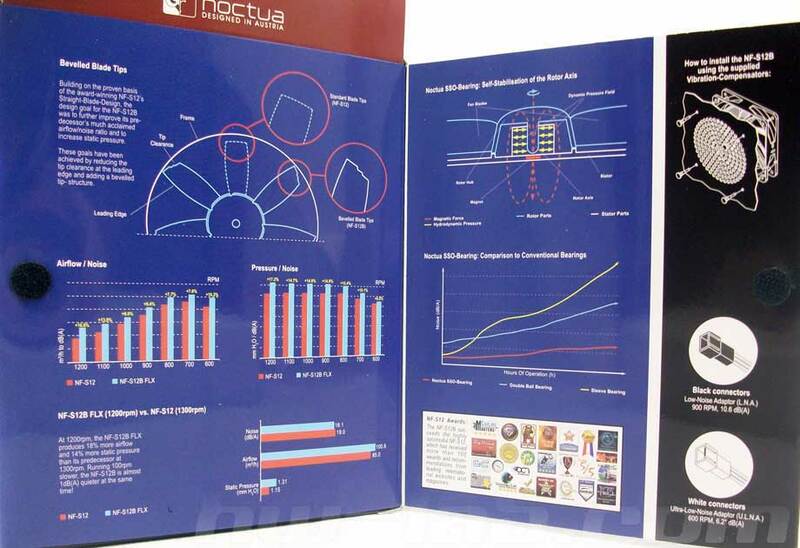 Besides, to provide users with even more information on this particular product, Noctua has equipped fan package with a small presentation booklet hidden on the back side of the box and sealed with a small velcro fastener. L.N.A. (Low-Noise Adaptor) decreases fan speed from 1200RPM to 900 RPM. Same time noise level drops from 18.1 dBA to 10.6 dBA, as well as the air flow — from 59CFM to 44CFM. U.L.N.A. 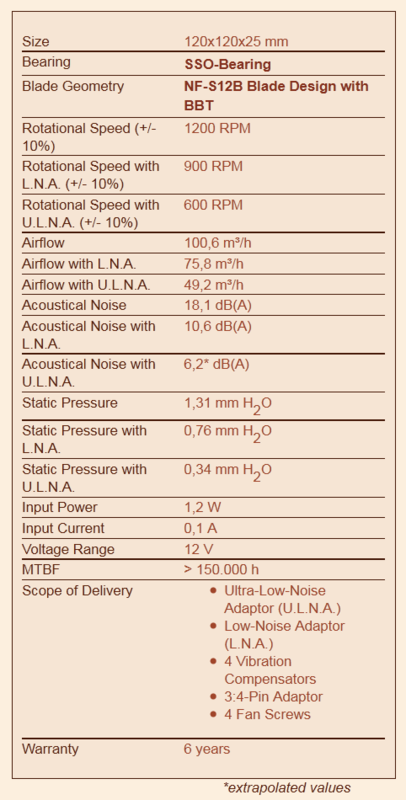 (Ultra-Low-Noise Adaptor) reduces fan RPM down to 600 RPM while decreasing noise level to 6.2dBA and airflow to 29CFM. 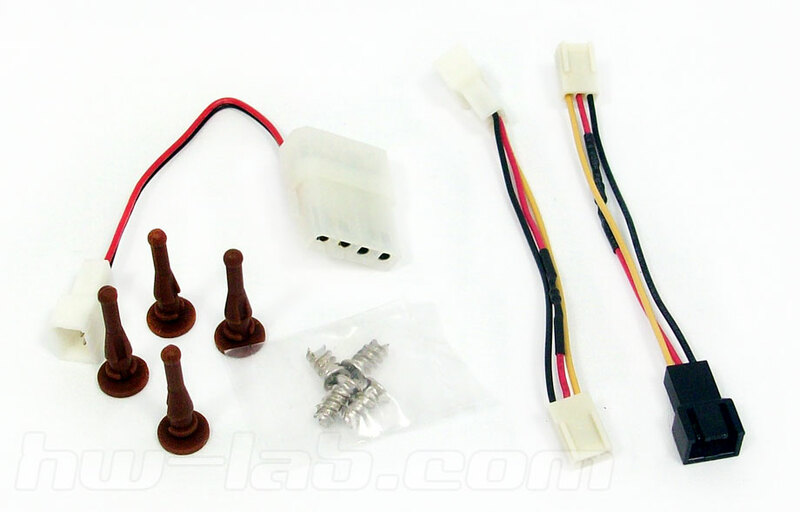 In order to not get mixed which is which, Noctua uses different colored connectors: black (on one end) for L.N.A. and white (on both ends) for U.L.N.A.. Essentially, such adapters are made by adding a resistor soldered in-line with the power wire (red): 52Ohm for L.N.A. and 149Ohm for U.L.N.A. Both are almost 11cm long (including 3-pin connectors). It’s better this model or new Noctua NF-A12x25 for a radiator on a liquid system?